Strategy is about the decisions which have medium-term to long-term impact on the position and activities of an organisation. It includes the implementation of those decisions, to create value for customers and key stakeholders and to outperform competitors. Strategic Planning is the programmed, periodic resetting of an organisation’s mid-to long-term strategic direction and priorities. Twoeyes’ Strategic Planning Process focuses on key issues and the specific initiatives needed to attain long-term strategic goals. Twoeyes’ broad range of strategic planning services and capabilities help clients develop long-term, robust, scenario-based strategies to accelerate their transformation into high-performance businesses with a clear understanding of where they are heading and how they will get there. Environmental and market analysis, to illuminate economic and political trends, industry and competitor factors. Stakeholder analysis, to identify the strategic factors that drive value for key stakeholders. Opportunity identification to reveal innovative and attractive business opportunities in the future market. Scenario analysis, to explore a limited set of future market scenarios based on the market analysis. Internal analysis, to uncover distinctive capabilities, market focus and positioning, and a performance blueprint that can drive high performance. Strategy formulation, to provide strategic direction designed for the future, taking into account market opportunities, internal capabilities, key stakeholders and future financial performance. Organisational alignment, to translate strategy into action, providing a high-level roadmap of the realisation process and a set of Key Performance Indicators to monitor and manage outcomes against plan. Financial modelling, which predicts future financial performance of a given strategic direction, including net present value and future shareholder value. Twoeyes’ clients can expect more than simply an accurate diagnosis of the strategic issue at hand: they want a practical, effective path to implement – one that can generate real bottom-line results, sustainable competitive advantage and make the company more valuable. Our proven innovation methodologies facilitate the creation of fresh and unique ideas. 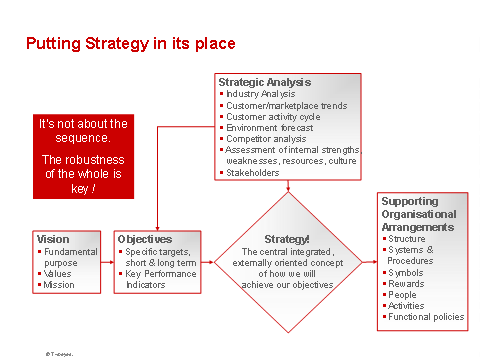 Our comprehensive strategy-formulating process ensures the robustness of the strategy. We have deep experience in developing and implementing business processes that facilitate the rapid and smooth execution of the strategy. Using a workshop-driven process, we promote significant client management team involvement to help ensure organisational anchoring of the outcomes. For a confidential, obligation-free meeting to discuss unlocking your organisation’s strategic potential, you are invited to contact Twoeyes Managing Director, Conor McKenna, directly on 0402 264 670 or email [email protected].